When kindergarteners are collaborating to build bridges, you know the future of education is bright. Long before students in the schools and districts featured here have a chance to ask “What difference does this make?” or “When will I need to know this?” they’re out on a boat gathering samples, investigating why a family member suffers headaches, outside measuring solar energy, or making connections that lead to a career. Whether you call it STEM, STEAM, or STREAM, cross-curricular, real-world education is helping students to make a difference in their communities now and preparing them for further education and careers. And creative collaboration is the key. “What if a tsunami hits Hawaii and cuts off our fossil fuel energy supply? We can’t even have light or running water. We’d go back to the caveman times,” says a student at Honowai Elementary School in Waipahu, Hawaii. Student inquiry on mini PV panels and multimeters for readings at Honowai Elementary School. With $50 million in annual energy costs and fuel prices rapidly rising, in addition to weather changes necessitating the installation of air conditioning in schools, assistant superintendent for facilities Dann Carlson explains that the department began by investing time in writing a creative RFP to find a primary partner for this sustainability program. OpTerra won the competitive bid, which included a unique power purchase agreement financed over 20 years at a fixed rate. Finance was a particular concern, as the Hawaii legislature determines all state funding for public schools. With DefinedSTEM as their curriculum partner, in 2014 work on the three E’s of Ka Hei—efficiency, electricity generation, and education—began. The first step was to perform energy audits in all 256 schools, install LED lightbulbs and other efficiencies, and begin educating everyone about energy and water conservation. As many schools are used as shelters during hurricanes and energy security is a pressing concern, community involvement and support are critical. “I didn’t know we used so much fossil fuel to do … everyday stuff. We gotta do something … Now I know why so many houses have PV and why we see wind turbines. It’s all good stuff for the aina [the Hawaiian word for land],” says another Honowai Elementary student. Teachers engage in a PD session on solar energy as part of the Ka Hei initiative. Ka Hei is taking advantage of the sun and wind, exploring innovative energy technology and installing photovoltaic (PV) panels. Eighty schools benefitted from a narrow window offering net energy agreements, and efforts to find creative ways to finance PV panels for the rest of the schools and to establish microgrids in five pilot schools are ongoing. This next phase, with the ultimate goal of net-zero buildings, also involves engineering storage solutions. A school blessing ceremony for a new PV canopy, part of the Ka Hei initiative. The STEM curriculum for the initiative “connects age-appropriate information and standards,” Shigeta says, but what’s most valuable for learning is the pairing of curriculum and equipment so that it’s effective for students’ different learning modalities. As a result, even young students demonstrate a deep understanding of their connection and responsibility to their environment. “Living on an island has many good things for us to do, like go to the beach, swimming, and hiking. But we need to look at energy like we look at our island. We need to understand and care for it,” says another of Shigeta’s students. 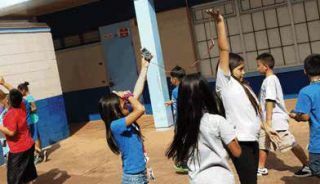 Learn more about this exciting initiative at http://www.hawaiipublicschools.org/ConnectWithUs/Organization/SchoolFacilities/Pages/Ka-Hei.aspx. It’s impossible to talk with Jamie Ewing, new STEM Educator at Amidon-Bowen Elementary School, in DC Public Schools, without catching the vision for STEM integration. “Most technology at the elementary level has been supplemental, as opposed to being integrated,” he says. But STEM education is all about critical thinking, and the earlier students begin learning this way, the better. PreK-3 to fifth graders at Amidon-Bowen take on the paper bridge challenge using paper, masking tape, and scissors. Ewing was hired to integrate STEM in third through fifth grades, but his question was: “Why not younger?” And he chuckles as he admits it’s been a learning process. When he gave Pre-K three-year-olds a pile of books to build an arched bridge connecting two chairs a few feet apart, he figured he’d need to show them how first. But the kindergarteners not only accomplished this task without being shown how but also found multiple ways to do it. Encouraging collaboration and teaching problem-solving skills at this tender age is not only possible, but critical. “By the time they reach fifth grade, this way of thinking is ingrained,” Ewing says. Ewing is a huge fan of Scratch and uses it especially with fourth graders, teaching coding and programming. His fifth graders use littleBits which, he says, “I absolutely adore. You set up the problem and there are a hundred different ways to do it.” Makers Empire, a 3D printing curriculum, is another key tool he uses to teach problem-solving. But Ewing hastens to point out that effective STEM education doesn’t require expensive equipment. His students in Seattle created instruments out of recycled materials, recorded music, and partnered with the MOHAI to present their pieces in the museum’s atrium. This kind of collaboration is not only creative, engaging, and effective—it’s also free. Ewing has found that museums and businesses often want to partner with education but don’t know how, and teachers don’t realize that they can reach out to these organizations. The solution? Talk to people. “I have yet to find someone who’s said no,” Ewing says. Amidon-Bowen Elementary students work in teams to produce sounds using littleBits Synth Kits. Social media can also facilitate unique collaborations. One of Ewing’s classes created stop-motion videos with students in Germany, and another Skyped with a school in Detroit. Edmodo, he notes, is great for global collaboration. And Twitter is one of his favorite ways to connect, support, and share ideas with like-minded teachers everywhere (@mrewingteach). Many of Nancy Foote’s students have followed the STEM path from her classroom at Sossaman Middle School in the Higley Unified (AZ) School District into related careers. These include “the young lady who hated science and math but loved the tech end of it” who is now majoring in physics and astronomy at college, “the academically talented student who is working on Orphan Diseases with the White House,” a few doctors, and even one “who really is a rocket scientist.” While Sossaman doesn’t have an official STEM program, the school offers many STEM classes and has a strong robotics program. Even in eighth grade, Foote’s students are solving real-world problems. One student, who was concerned about his dad’s headaches that baffled even the doctors, had an “aha!” moment while designing a dream house with CO monitors. His dad drove a convertible, in heavy traffic, every day. So, Foote says, “He borrowed my portable CO monitor … They set up an experiment.” Sure enough, when the car’s roof was down in heavy traffic, CO levels were “excessive,” but “with either the roof up or with light traffic, the levels were acceptable.” This discovery had a huge impact on the student’s entire family. Eighth graders at Sossaman Middle School compare heating and cooling curves for two liquids using a wireless PASCO temperature sensor and an iPad. Students at Sossaman engage in many exciting projects, including a thermal ice house challenge using a University of Arizona curriculum, an introduction to the engineering design process, and much more. An eighth grader at Sossaman Middle School presents her physics graphs to her peers using a HoverCam document camera. When the Wisconsin Department of Natural Resources declared Green Lake to be “impaired” in 2014 because it fails to meet optimal water quality standards, the diagnosis launched a groundswell of community action. Wisconsin’s deepest inland lake, at 236 feet, creates a unique environment for different species of fish as well as opportunities for tourism and recreation, explains Dan Starr, science teacher at Green Lake High School. The whole community, including local and state organizations, banded together to organize a movement to protect their treasured natural resource. And a Vernier/NSTA Technology Award provided equipment that helped make student involvement in these efforts a reality. Green Lake High School students work on a tributary of Green Lake. Phosphorus loads from various urban and agricultural sources are a possible cause of the low dissolved oxygen levels in the lake’s thermocline, but assessments of all aspects of the health of the lake and its tributaries are ongoing. Starr’s students, along with chemistry students in Jason Ladwig’s class, dove in with their Vernier equipment to measure temperature, flow, and turbidity as well as dissolved oxygen, pH, nitrates, and phosphorus levels. Engagement is high, Starr says, “especially when it’s working and there’s a boat involved.” Complications are part of real-world science, though, and “students need to be part of the process and appreciate that things aren’t always perfect,” he says. While state-of-the-art data-collection technology gives students unprecedented opportunities, Starr points out that it’s also instructive, and fun, for students to measure such things as a waterway’s Biotic Index using low-tech equipment like nets, ice cube trays, and charts for identifying microorganisms. Starr’s initial goal is for students to mirror the measurements “real” scientists are taking and eventually for students to join in the community discussions, present their findings, and even be involved in decision-making to help protect their lake. None of this student work would be possible, Starr emphasizes, without collaborators in the wider community. As a result of these networks, students will work this fall with Mary Jane Bumby, a long-term water quality citizen scientist—seeing her equipment, comparing data, and learning about standards and best collection practices. The large boat needed for student data collection is provided by Mike Norton, a local charter fishing guide, who takes students out and shares tales of his work and the history of the lake. The DNR also provides its expertise and equipment through Water Action Volunteers (WAV), a statewide, citizen-based monitoring group. The Green Lake Sanitary District and the Green Lake Association have both provided invaluable support throughout the process to engage students with hands-on activities. In another example of this kind of collaborative work that marries learning and real-world conservation management, a chemistry class, led by a teacher trained in collecting and packaging samples, collects monthly water samples and sends them to a state facility for analysis. The students benefit from the educational opportunity and from helping to make a difference, the state benefits from their volunteer efforts—and the Green Lake Sanitary District picks up the costs. Green Lake High School students use a Vernier Dissolved Oxygen Probe and Extra Long Temperature Probe on Green Lake. Starr is grateful for all of these relationships—with these organizations and with Vernier. “The students’ eyes brighten when they use this equipment and see it happen,” he says. The Kent (MI) Intermediate School District (ISD), a regional educational service agency in Grand Rapids, supports over 120,000 students in 20 public districts and also charter schools in all curricular areas, including STEM. They host a high-tech incubator school and an online high school and offer high-school courses at their campus including manufacturing, IT, and design; mechatronics; 3D animation; machining; and health careers. Sand Lake Elementary students, benefitting from Kent ISD services, watch a 3D printer print out their 3D models. Kindy Segovia, assistive technology supervisor, explains: “Our focus is to bring real-life experience and interaction with industry to the classroom for students of all abilities,” including professional development and research opportunities and partnerships with businesses and colleges and universities. Career Readiness is one of the highly collaborative departments within Kent ISD, supporting staff and students to bring the real world to the classroom—and vice versa. Their community partners include the airport, a downtown retail and culinary venture, Habitat for Humanity, local health-care facilities, and a workforce development association. While not all districts have access to the kind of resources that Kent ISD provides, educators everywhere can follow their example of networking and connecting with local businesses. With a Kent ISD STEM consultant, third graders in Kentwood Public Schools program a UAV (drone) for flight. The department has initiated several successful ventures that bring students into the workplace. Their job—shadowing program links students with professionals for after-school jobs, summer internships, and an annual day of learning and observation (on Groundhog Shadow Day). These experiences help students narrow their vocational focus and also broaden their options. Ebiri Nkugba, STEM consultant for Kent ISD, is proud to have been part of building a program with Kenowa Hills Public Schools in which students prepare for the workforce by attending classes in an actual workplace. Yet another area of collaboration linked to STEM education in which Kent ISD supports students is in the area of assistive technology. Segovia feels fortunate to work in a place with such a broad reach and interdepartmental cooperation. When Nkugba sets up a new STEM initiative with a teacher, for example, he will consult with Segovia concerning tools and adaptive approaches to support the specialized needs of students with disabilities. Segovia often equips teachers with tools such as Tiggly and Osmo to help these students engage, learn, and create. Kent ISD’s large lending library of tech tools is another program that facilitates and enriches learning for staff and students. With these rich resources and collaborative enterprises, Kent ISD is preparing all students for future educational and vocational success. Michelle Carlson first learned of the Maker Movement when she was working at the Tehama County (CA) Department of Education. From her experiences with teachers and students, she “knew this could provide an amazing solution for engaging all learners and bringing more real-world connection and relevance back to the classroom.” She turned an underutilized space at the DOE office into a makerspace and watched her “vision to make learning joyful” come to life. Students at Evergreen Middle School explore their makerspace. When district superintendents began approaching her about this work, she founded Future Development Group, LLC. And since May 2015 she’s collaborated with schools and districts including Vista Preparatory Academy, Evergreen Union School District, Maywood Middle School, in the Issaquah (WA) School District, and the Butte County Office of Education, as well as the local juvenile justice center. Carlson focuses on “building capacity within systems, creating the spaces which allow for a ‘maker experience’ as well as mentoring teachers and school leaders with the goal of helping them to reach a point where they no longer need outside help.” It’s important, she notes, to have “a complete system of support” in place. Knowing that most schools can’t afford a consultant to help them get started, Carlson put all of the curriculum, resources, and teaching from a successful program she created last year at Corning Elementary District into a book called 180 Days of Making: How to Incorporate Experiential Learning in Ways that Will Change the World for Your Students. ■ Helping to write grants so the Tehama County Arts Council could offer a successful “Maker Summer” program with free arts and maker workshops for families. ■ Partnering with San Francisco’s Exploratorium and Redding’s Turtle Bay Exploration Park to offer Maker Educator Meetups (MEM) at Turtle Bay. ■ Arranging a visit from Tinkercad specialists, who will talk about careers in design and fabrication and hold a 3D design session for teachers. ■ Watching local professionals she and friend Melissa Mendonca have enlisted as volunteers share their expertise (in graphic design, music, etc.) with students. Amidon-Bowen’s Jamie Ewing, who did this project during a NASA training, launches the activity by showing a PowerPoint of bridges—from rope bridges to highly engineered bridges. CHALLENGE: To build the longest bridge between two chairs. Students should work in teams of no more than two or three. Once the challenge has started, answer no questions. THINGS TO LISTEN FOR: Conversations on how to construct, what the definition of a bridge is, design, redesign, and evaluation of their work. HINT: Ewing and his PreK students built one together as a class before the students did the challenge themselves.